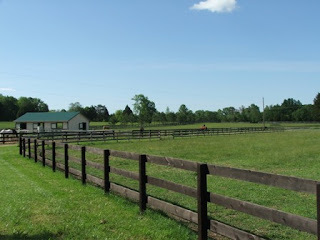 On May 17, Traveller’s Rest attended a seminar in King George, VA, called “The Environmentally Friendly Horse: Caring for Your Land.” The program focused on keeping horses healthy while also keeping farms and pastures “healthy” through proper management. One of the most interesting aspects of the seminar was the discussion of how modern horse owners try to force horses into a particular management style rather than molding a management plan to fit the horses’ natural requirements. Developing a “natural” management program is becoming more difficult in Virginia as farm sizes shrink and stocking rates increase. Poor management and crowded farms are leading to less healthy horses. Of particular note is the increase in unfit, overweight and obese horses. A study by Virginia Tech determined that 51% of horses surveyed were overweight or obese (only 5% of owners surveyed felt their horses were too fat.) Surprisingly, grain-based feeds do not seem to be the problem. Horses evolved to graze “scrub” plants, ranging 8-15 miles a day to meet their nutritional needs. Even though, in the wild, horses would spend most of their time eating, they were constantly on the move while they ate. 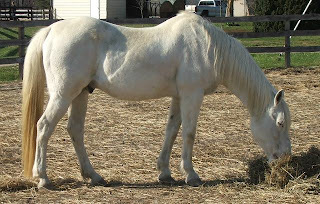 Today, in many areas, horses are grazing lush grass pastures or eating rich grass or legume hays, often standing in one place or walking over very small areas. Both the food and the method in which it is presented are contrary to the way equine species evolved. Richer pasture + less exercise = fat horses! 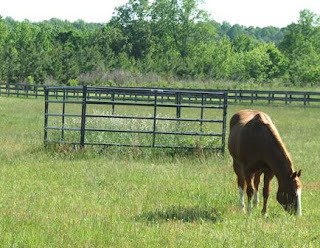 Many of us with overweight horses try to manage the problem by restricting grazing time. Guess what? That doesn’t work, unless by “restricting” you are talking about limiting grazing to only an hour or two a day. Horses, if healthy and left to their own devices, will eat the amount of forage their body says it needs in any given day. 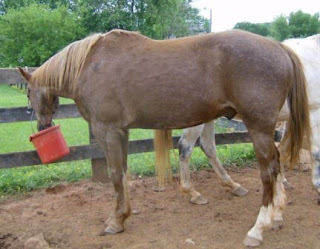 During 24-hour a day turn out, a horse may consume 0,8 – 0.9 pounds of forage (dry matter) per hour. A horse on pasture only part of the day, however, may eat up to 3-4 times that amount per hour to “make up for lost time.” Simply cutting back on hours spent grazing will not necessarily reduce total calorie intake. Instead, consider turning out on a dry lot with hay, or using a grazing muzzle when turn out is on pasture. Oh, and ramp up that exercise program! Even though, by May 16, we'd received twice the normal monthly rainfall, we're not complaining. Look at all this green! To understand the celebration, take a look at this from last July. Send TREES the Proof of Purchase seals from your Triple Crown, Reliance, or Legends feed bags. We can redeem them through the Southern States SHOW program for cash! These two boys could not go when their owners had to move to a smaller property. They are currently being cared for by the property's new human resident who is helping the owners find a permanent new home. She may be able to offer transport if new home is within 100 miles of Warrenton. The boys do not have to go together to one home. If interested, please email TREES for contact info. 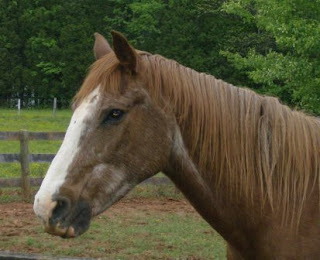 The older gelding is named "Agenda" he is 27 years young, is a quarter horse and looks very good for his age. He seems to have a hitch in his rear left hind leg I guess from a previous old injury, but according to his owners he is sound for light riding. He doesnt have any health issues I am aware of other than needing his teeth floated. He drops his feed everywhere. He is a very sweet boy is easy to halter and lead and loves to be brushed, he is used to wearing a fly mask but doesnt like blankets or being stalled. He is current on his shots and wormings as I have been doing them since I got here. He feet were done just prior to my moving in and I believe the owners are going to get them done again next week when the farrier is due out here. 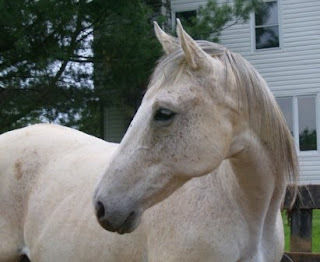 The other gelding is a Thoroughbred his name is Jubilee he is 14 years old. He is also very sweet with an inquisitive personality. He is a bit more pushy of the two and could use a little work with his ground manners. I dont think this is an issue of teaching him, but rather reminiding him of his place. He does appear to have an old injury to his rear left ankle it has a hard bony growth on the outside. This doesnt effect him running in the pasture, but I am not sure if it would with the added weight of a rider. He too is up to date on vacs and worming, but needs a coggins. His feet were also done before I moved in, they were not able to be trimmed enough as they were so overgrown so he could use a good farrier and more frequent trimmings. The owners were willing to get them a coggins before they left here, I am sure if proper placement is found this would still be the case. I can transport within 100 miles of Warrenton if this will help with placement. Local May rainfall records have been dropping like flies, and we're only half way through the month. After last year, a few large puddles are a welcome relief. Recent rainfall should be a good start toward replenishing wells and reservoirs. The temperature hovered around forty degrees last night but, with sustained 30mph winds and a horizontal rain, it felt like a winter storm was in progress. Weather lore in Virginia says to wait for Mother's Day to set out plants in the garden. Its a mark on the calendar saying "Spring is here." This year, Mother Nature wanted to heave one last winter gasp before Mother's Day passed. Even though the horses all had access to cozy sheds, and were dry and sheltered from the wind, some were shivering as breakfast was served. Jeb, Emma, and Betty are now comfortably munching hay with their winter "jammies" on once again. Last week we were preparing to have a huge pile of blankets sent out for cleaning and repair after a colder than normal winter. This time, it seems that procrastination was a good thing! Researchers have found that horses with PPID have very few dopamine-producing neurons in the pars intermedia. Since dopamine inhibits the production of hormones by the pars intermediate, its absence allows excess hormone production which leads to the classic symptoms associated with Cushings. While dietary management and supplements help control symptoms resulting from high insulin levels, and Trilostane can directly inhibit the production of cortisol, only one medication in current use addresses the dopamine deficit, believed to be the root cause of the problems. That drug is pergolide mesylate, a medication originally prescribed for human Parkinson's patients. Upon diagnosis, all PPID horses at TREES are started on Pergolide. The following are some of the questions Traveller's Rest Equine Elders Sanctuary answers on a very regular basis. This list also represents the beginning of a FAQ page on the web site. If you would like further details on these FAQ's or have any other questions concerning TREES, please email. 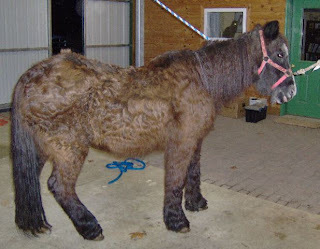 Why do you focus on old horses when they are so many "ridable" horses in need? It is our belief that horses are no less deserving of lives free from hunger or pain merely because their physical abilities are not what they used to be. 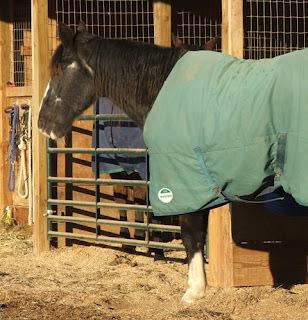 Some shelter facilities will not accept "special needs" elders because they cannot provide the specialized care required or because they do not have the ability to keep horses that may be permanent residents. Though TREES has limited space, we provide a safe haven for horses who have nowhere else to go. Does the sanctuary's name have anything to do with General Lee's horse in the Civil War? Does the sanctuary receive government funding? Can I volunteer if I haven't worked with horses in the past? Absolutely! You are welcome to help the senior horses in whatever ways are comfortable for you. You can begin your volunteer efforts doing chores that do not deal directly with the horses, such as cleaning stalls or maintaining water tanks. If you like, you can then begin learning to work with the horses themselves, grooming, feeding, or helping during vet visits, for example. You can also help with jobs, like fundraising or writing educational handouts, that don't require a visit to the farm. You will never be asked to do anything you are uncomfortable doing. TREES strives to maintain a stress-free environment for our equine residents and our human volunteers and visitors. Volunteer. As a volunteer, will I be asked to commit to a certain number of hours? We do not have formal "business hours." TREES welcomes visitors by appointment as work schedules and weather allow. Where do the horses at the sanctuary come from? Several of the residents at TREES were abandoned at boarding stables. A few were left behind when owners sold property and moved away. Some were brought to the sanctuary by owners who realized they could not provide the special care required. 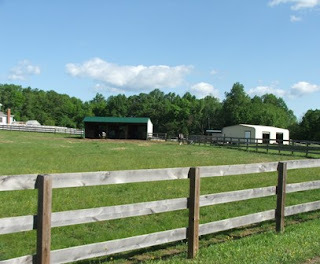 On occasion, if space and resources are available, the sanctuary accepts horses due to owner hardships such as a change in financial situation or physical capability. For the most part, the criteria used to accept horses focus on whether or not that horse will suffer pain or hunger if left where it is at the time of the call. If, at that time, TREES cannot accept another horse, efforts will be made to place the horse in a new home or with another equine welfare organization as quickly as possible. Do you buy horses from auctions? No. With so many horses in need of shelter, whether they've been abandoned or are still with owners who can no longer care for them, it would be a very inefficient use of donated funds to buy horses. 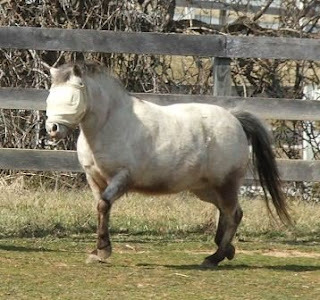 In addition, TREES does not spend funds on having horses hauled to VA from great distances when there are so many in need in the immediate region. Does the sanctuary have horses available for adoption? All of our residents are available for adoption. Take note, however, that almost all of our horses have special needs to some degree. Potential adopters will be screened thoroughly to determine their ability to provide specialized care when needed, and post-adoption follow-ups will be performed to ensure proper care is being given. For those reasons, adopters must live with in a three hour drive of Spotsylvania, VA, 22553. How much do you charge for boarding retirees? TREES is not a boarding facility. "Googling" is part of everyday life for most of us. "Google" has even become a verb to many. "Google it!" We're asking you to try Giving up your Google. At least give it a try. When you do your internet searching through isearchigive, using this link - http://isearch.igive.com/?s=28&c=29456 - Traveller's Rest will get $.01 for each search. Through May 4, we'll get $.02 ! That doesn't sound like much, but if you search as much as we do some days, it will add up.